Fashion Friday is back true believers with a must for the fashion forward Marvel fan on the go – brand new bags! Perfect for a summer at the movies, these bags range from Captain Marvel to popular fan favorite Agent Peggy Carter. Whether not you’re catching the black and white version of Logan (Logan Noir hits theaters May 16th!) 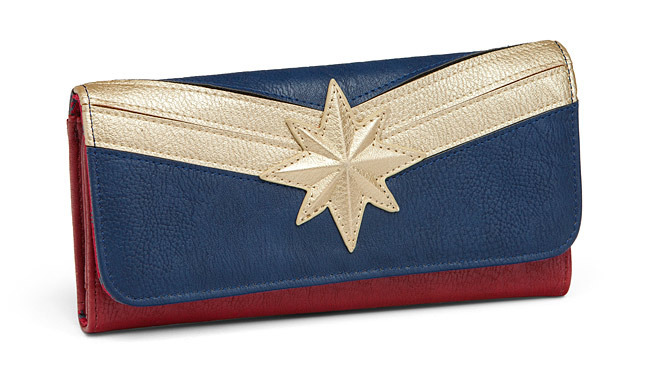 or you’re in line for Thor: Ragnarok, these ThinkGeek purses are a must for any Marvelite looking to bag themselves a snazzy look this summer. Each bag comes with a matching wallet to complete your ensemble, check out these heroic looks below! Billed as “the perfect partner for any situation”, Agent Margaret ‘Peggy’ Carter has spawned a short lived television series (gone too soon), multiple roles in the MCU, and has shaped SHIELD – everyone’s favorite spy organization from the ground up. Now you can model Peggy’s classic take no prisoners style with this bag that ThinkGeek calls, “The perfect partner for a night on the town.” Full of pockets and lined with a special polka dotted SSR lining (no really, the polka dots are SSR symbols!) it’s a must for any Agent looking for the truth – especially if they want to look amazing while doing it. The bag as well as the matching wallet are cruelty free vegan leather from Loungefly. 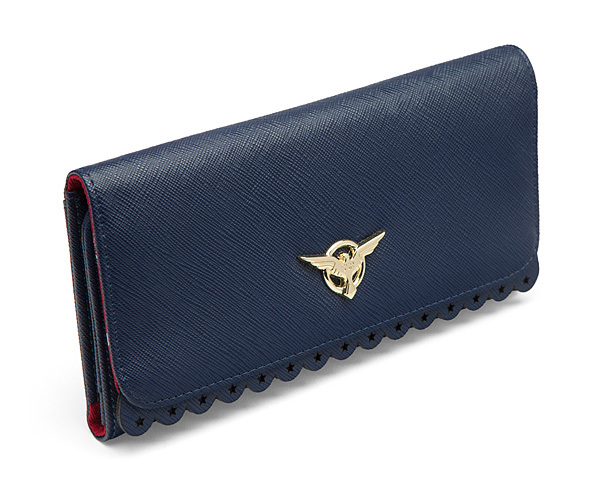 The wallet, much like Peggy’s faithful butler Jarvis, acts as a perfect compliment to the bag. Lined with scalloped edges and that same iconic polka dot lining, it’s just as inventive as Peggy’s butler sidekick. The wallet has multiple pockets, a large billfold and a coin purse on the side. 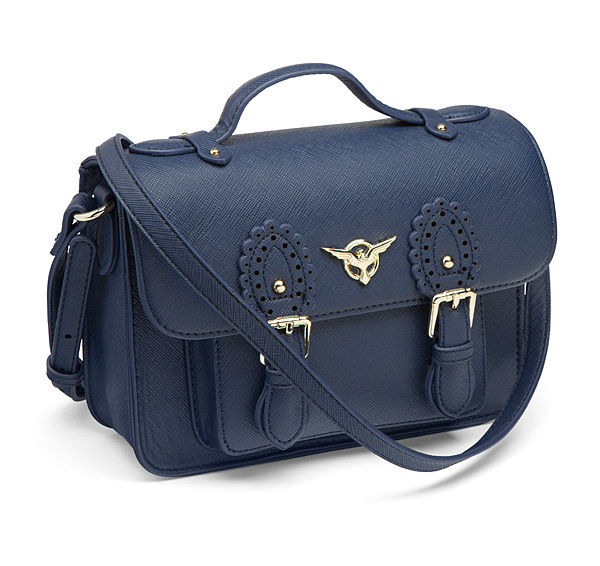 You’ll be armed for any emergency with it, and paired with the bag it’s a must for any Agent Carter Fan. The bag retails for $69.99 and the matching wallet retails for $34.99. 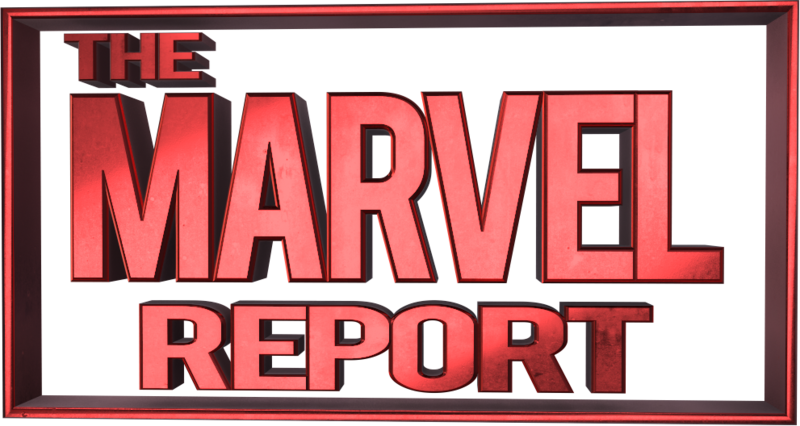 Carol Danvers is arguably one of the most anticipated characters coming to the MCU. Details about her powers and abilities are a mystery with only a rare few seeing just how she’ll look in the new film. We have a brand new bag from Loungefly and ThinkGeek that gives us the perfect accessory to the 2019 event of the year. 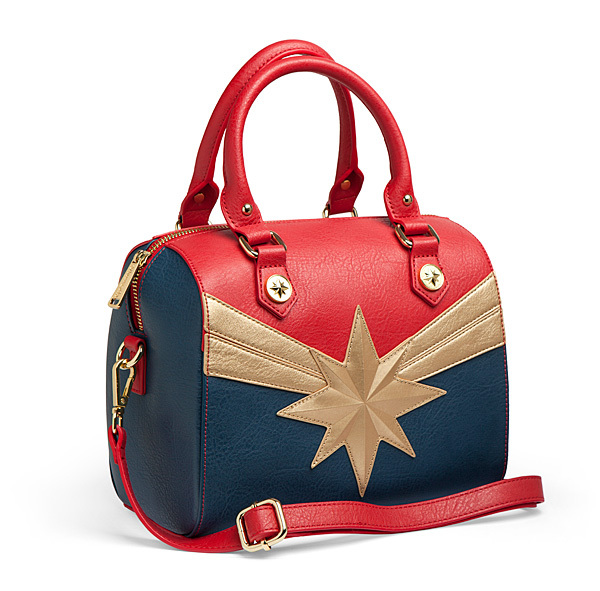 Featuring Carol Danvers’ signature starburst design and a pair of metallic starburst rivets on the handles. Much like Carol herself the bag has a hidden talent – in this case a cross body strap and 3 pockets for storing every essential piece of gear you’ll need for a night out on the town or potentially fighting Kree agents. The lining is pure Marvel, literally emblazoned with the black on black Marvel logo. 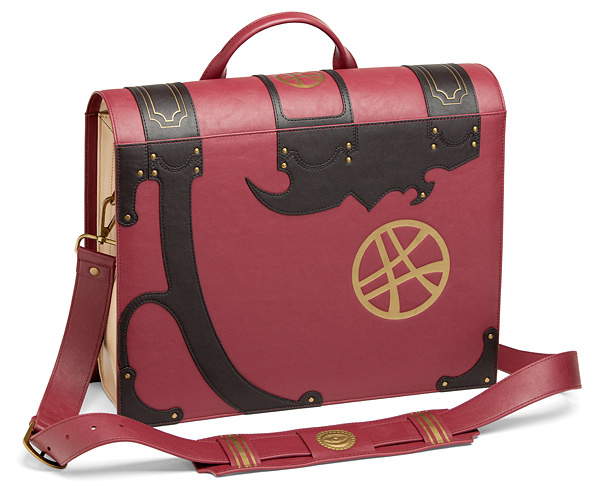 A must for any Doctor Strange fan, the “Book of Vishanti” messenger bag is based on the powerful magical book that’s used as a counter to the Darkhold. This bag is a must for any Sorcerer Supreme on the go with room for your laptop, books, an umbrella and any other supplies you might need to battle the forces of evil. This bag’s lining is pale leather and the detail reproduces the book itself almost perfectly. That’s not the only magical trick this bag of holding has up its sleeve however. With a hidden pair of straps this messenger bag can become a backpack – perfect for marching to any mystical cities you might find on the way. This bag is an original Thinkgeek creation and a fun unique piece perfect for Doctor Strange 2. ThinkGeek has an incredible collection of bags for the Marvel fan on the go – not limited to the ones we’ve described here. If you’re looking for the perfect premiere gear for your next Marvel adventure or looking to showcase your geeky side give their bags a look. Which one do you like the best? Let us know in the comments below! Marvel Announces Star Wars: Rogue One – Cassian & K-2SO Special #1! RUMOR – Did X-Men: New Mutants Director Confirm Maisie Williams As Wolfsbane?